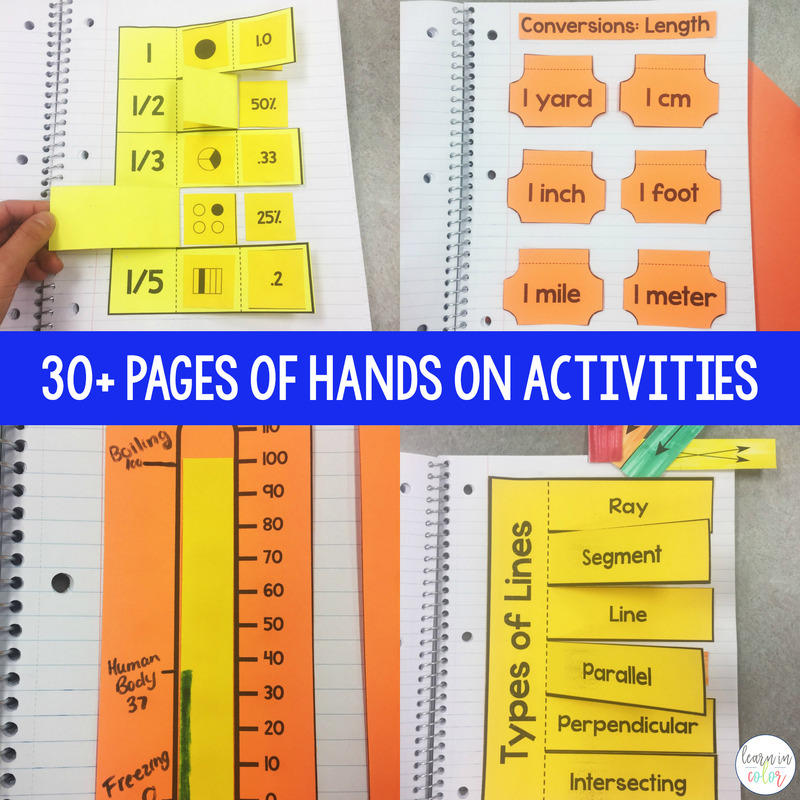 This Math Interactive Notebook is filled with over 30 pages of hands-on math activities for grades 4-8. Learn about fractions, multiplication, types of triangles, and more! Firstly, grab your copy of the Math Interactive Notebook at my store or on Teachers Pay Teachers. This Math Interactive Notebook bundle comes with over 30 jam-packed pages full of math activities for grades 4-8! It is designed to pair with The Ultimate Math Cheat Sheets, with a bonus page for the different Types of Lines, a page that was highly requested for The Ultimate Math Cheat Sheets! Use Astrobrights colored paper for instant bright, colorful results, or have students color their own! However you learn best, create your own custom interactive notebook! To get started, simply cut, glue, paste, and color! Make each page your own. Easily use the premade templates or come up with your own examples. The options are endless! 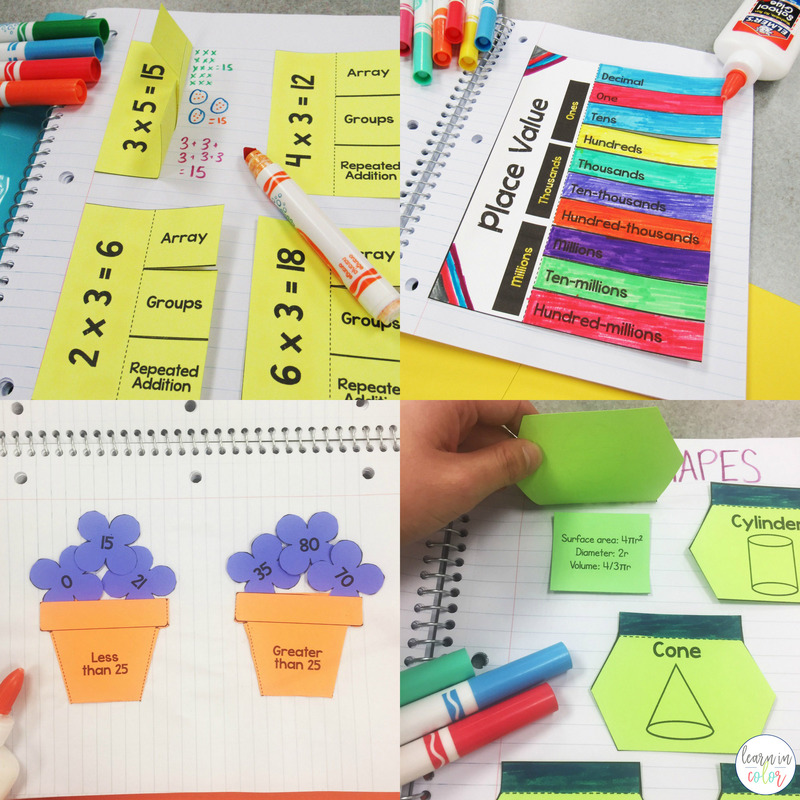 From decimals to place value, get hands-on to truly personalize your math notebook. Need some help on where to start? Step by step directions are included – no need to spend hours researching or guessing how to use them. What are you waiting for? Grab your copy of the Math Interactive Notebook at my store or on Teachers Pay Teachers. Don’t forget to grab your Language Arts Interactive Notebook for language arts learning!